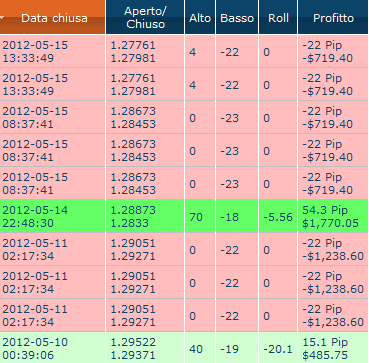 Experiment #2: Tecnotrader + PipDefender = ? If the signal would have followed in reverse, it would have been very profitable! Unfortunately, I already had a bad experience with the reverse function: the trade is replicated in the opposite direction, but the spread between buy/sell prices is not taken in consideration. The Take Profit and Stop Loss are simply inverted. Hence, when six months ago I tried that function, happened many times that the take profit was missed by a few pips: the trade was closed on the signal account, but not on mine, become “orphaned”, and unmanaged. The signal was losing, and I was losing too! Moreover, the long-term objective of signal providers it’s to make profits, not losing (also because if at the end of the month the balance is negative, they wouldn’t get any commission rebate). I’ll pair the reverse with PipDefender, to make sure to have a safer profit, as I did in the experiment 1. Will it work? Funzionerà? Stay tuned!